GO.32 CPS to Telangana Model School Staff, CPS to TS Model School Principals,PGTs,TGTs, CPS to TS Model School Teachers, CPS to TS Model SChool Teaching Staff. Contributory Pension Scheme (CPS) to Telangana Model School Teachers. 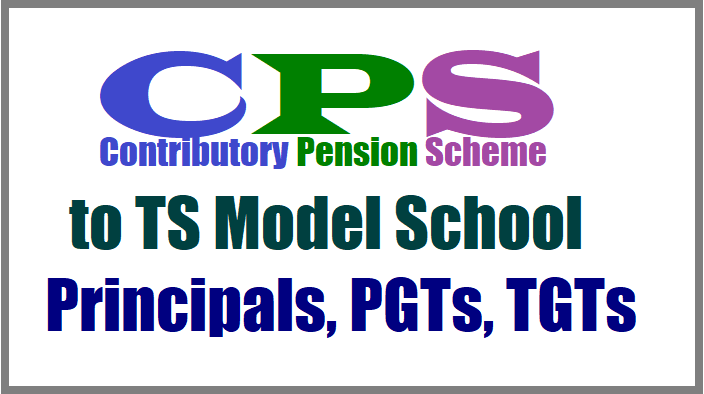 Proposal for implementation of Contributory Pension Scheme (CPS) to the Principals, Post Graduate Teachers and Trained Graduate Teachers working in Model Schools in Telangana State with retrospective effect i.e., from 2013-14 onwards, on par with the Teachers of the other Societies. School Education Dept- Proposal for implementation of Contributory Pension Scheme (CPS) to the Principals, Post Graduate Teachers and Trained Graduate Teachers working in Model Schools in Telangana State with retrospective effect i.e., from 2013-14 onwards, on par with the Teachers of the other Societies - Approved. Director, Model Schools, Telangana, Hyderabad, Lr.Rc. No.156/A1/MS/TG/2014, dated 26.02.2015. 7. From the Director of School Education and Ex-Officio Project Director, RMSA and Model Schools, Telangana, Hyderabad, Lr.Rc. No. 156/A1/MS/TG/2014, dated 02.03.2016. 8. From the Director of School Education and Ex-Officio Project Director, RMSA and Model Schools, Telangana, Hyderabad, Lr.Rc. No. 156/A1/MS/TG/2014, dated 23.09.2016. 11.From the Director of School Education and Ex-Officio Project Director, RMSA and Model Schools, Telangana, Hyderabad, Lr.Rc. No. 156/A1/MS/TG/2014, dated 25.11.2016. 13.From the Director of School Education and Ex-Officio Project Director, RMSA and Model Schools, Telangana, Hyderabad, Lr.Rc. No. 156/A1/MS/TG/2014, dated 07.01.2017. In the references 1st read above, Contribution Pension Scheme (CPS) was introduced for the employees of the State Government based on a Defined Contribution, for all the employees, who are recruited on or after 01.09.2004 and instructions issued to implement the scheme. Principals; 2165 Post Graduate Teachers(PGTs) and 852 Trained Graduate Teachers(TGTs), total 3123 Teaching Staff and they are working in the Model Schools from the year 2013-14 onwards and drawing the salaries from the regular State & Central Budget released by the State Government upto 2014-15. Thereafter, the Model Schools Scheme was delinked by the Government of India from Centrally Sponsored Scheme from the year 2015-16 onwards and the State Government is bearing the full expenditure from the Financial Year, 2015-16 onwards. 3. The employees appointed after 1st September, 2004, as per the references 1st read above, have to be covered under Contributory Pension Scheme. In the reference 8th read above, it was informed that an amount of Rs.31.97 Crores has already been deducted from the salaries of the Teachers i.e, Principals, PGTs & TGTs, as a portion of CPS as their contribution and is withheld by the Principals concerned and kept in their School Bank Accounts. 4. In the reference 3rd read above, the Director of School Education and Ex-Officio Project Director, Model Schools, Telangana, Hyderabad, has requested the Government to issue letter of consent indicating the commitment for discharging the obligation i.e., deducting contribution from the Teachers and adding matching amount from the employer, to be remitted to the Head of Account of National Pension System so that all the Teachers of Model Schools derive the benefit of CPS, consequent on superannuation or otherwise. The contribution payable from the Management shall be included in the Head of Account “Salaries” of Model Schools and claimed from the recurring expenditure. 5. In the reference 11th read above, it is stated that on various occasions Teaching Staff working in the Model Schools have requested to implement the Contributory Pension Scheme since their share of CPS is being deducted from their regular salaries by the Principals concerned. In this connection, the matter was placed before the Executive Committee Meeting of the RMSA & Model Schools held on 12-02-2016, wherein the Committee has unanimously resolved to extend the Scheme of Contributory Pension to the Teaching Staff working in the Model Schools and address the Government for final approval. 6. Further, in the reference 11th read above, it is informed that the Contributory Pension Scheme is being implemented in the Telangana Social Welfare Residential Educational Institution Society (TSWREIS); Tribal Welfare Residential Educational Institution Society (TWREIS); Telangana Residential Educational Institution Society (TREIS) and Mahatma Jyotiba Phule Telangana Backward Classes Welfare Residential Educational Institutions Society (MJPTBCWREIS) in the State. 7. In the reference 13th read above, it is requested to implement the scheme with retrospective effect as the deductions were made towards CPS from the salaries of the Teaching Staff from the date of their joining in the Model Schools and kept in the School Bank Accounts. 8. After careful examination of the matter, Government hereby accord permission to the Commissioner & Director of School Education and Ex- Officio Project Director, Model Schools, Telangana, Hyderabad, to implement the Contributory Pension Scheme (CPS) to the Principals, Post Graduate Teachers and Trained Graduate Teachers, working in the Model Schools in Telangana State, with retrospective effect i.e., from 2013-14 onwards, on par with the Teachers of the other Societies and as per the references 1st read above, by meeting the expenditure from the budget sanctioned to the Model Schools by the Government. 9. The Commissioner & Director of School Education and Ex-Officio Project Director, Model Schools, Telangana, Hyderabad, shall take necessary action accordingly. 10. This order issues with the concurrence of Finance (HRM.V) Department vide their U.O.No.12302/201/A1/HRM.V/2016, dated 12.04.2017.